This is another recipe inspired by our trip to New Orleans. The highlight of our trip was attending a cooking class at The New Orleans Cooking School. It was a demonstration class. Anne, our instructor, made gumbo, jambalaya, bread pudding and pralines. The gumbo was the best thing we ate in New Orleans. It was seriously delicious. The pralines were the second best thing! I had never had any interest in making pralines from scratch, but I quickly moved them to the top of my list after the class. 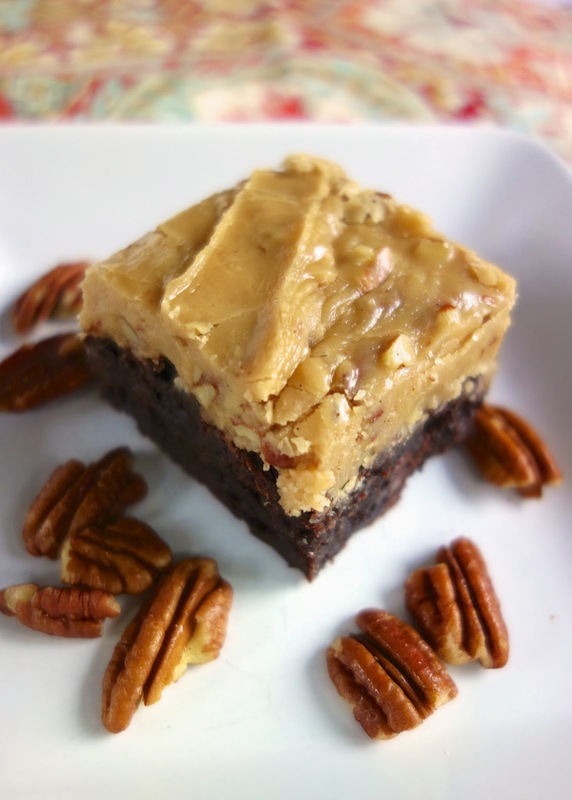 This Praline Brownie recipe combines two wonderful desserts into one. The base of the brownie is a box mix, but feel free to use your favorite homemade brownie recipe. I cheated with the box mix because I had a bunch from a recent trip to Sam's. 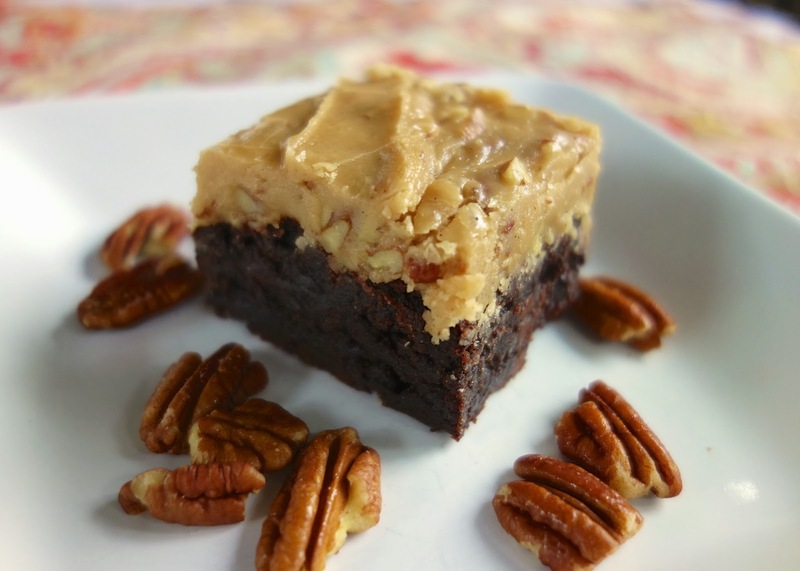 The frosting is the star of these brownies. It is wonderful! Surprisingly, it is not too sweet. Now, that is not to say these brownies aren't super rich. They are. I suggest cutting them into small bite-sized brownies. Make the brownies in a 9x13 according to package directions. (Bake both boxes in the same pan). Cool completely. In medium saucepan, combine cream, butter and brown sugar. Cook over medium heat, stirring frequently, until mixture comes to a boil. Continue boiling 1 minute, stirring constantly. Remove from heat. Stir in pecans, powdered sugar and vanilla. Cool 5 minutes, stirring frequently. Spread frosting over brownies. Allow to stand 30 to 45 minutes, or until frosting is set. Cut into bars. What an experience watching a cooking demo IN New Orleans! I have made pralines only few times, I think I'd rather have this frosting Wow! I'll be pinning these for sure! I noticed you mentioned using two packages of brownies in the 13 x 9 inch pan. I've noticed recently that the boxed brownie mixes are somehow "off" with their volume; I had one recently where the batter barely covered the bottom of the pan. Have you had that experience too? I even used a 13 x 9 package in a 9 x 9 pan and they were still a little thin. I know it's not my oven because it's brand new! YES! All boxed mixes are getting smaller, especially brownies. OK - good to know I'm not losing my mind...well, at least not about that! A cooking class on a trip! How fun! These bars look delicious! The cooking class was the best thing we did in NOLA. The food was great too! I do love pecans. And with chocolate? Yes, please! I'm interested in knowing information on the cooking school, I'm about 3 hours away from NOLA and would like to take the class along with some friends. What's the name of the school and what's the cost? We were in NOLA for spring break this year and took the cooking class at New Orleans School of cooking with Chef Kevin. Just do a search and there are different times you can take it. If you go on the visitors guide to New Orleans you may find a coupon code. It's a great deal and lots of fun! It's right in the downtown area. Made these and the frosting was kinda hard and chunky....did I do something wrong? What type of brown sugar should I use? Dark or light?